Well-appointed beach cottage on quiet end of Isle of Palms (IOP) beach. With its open floor plan and comfortable furniture, this four bedroom beach house easily accommodates groups. The light, open living space allows your family and friends to gather together while unwinding from the surf and sand. 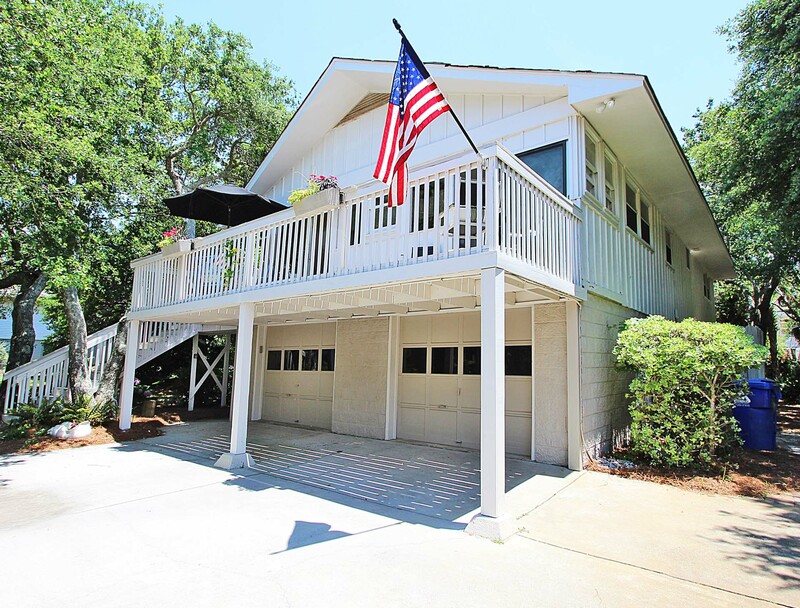 Relax with a drink on the sun porch, watch the sun set over the (peak-a-boo) view of the ocean from the large deck, then enjoy your supper outside in the shade of the live oaks and palm trees. This is low country living at its best. The kitchen has everything you need to prepare your own meals (and a gas grill outside). The two main level bedrooms each have a two-piece bathroom (sink/toilet) with access to a shared shower. Downstairs are two additional bedrooms with a shared bathroom (shower only). The colorful “kids” room offers three (3) twins and space for the included pack-n-play. The “Full” room includes two (2), full-size beds and an internet TV with Netflix and Wii. Down the hall and through the mudroom, you enter the garage; stocked with laundry, foosball table. Only three houses away (no roads to cross), is access to one of the least populated stretches of the magnificent Isle of Palms beach. You can pack a cooler and stay all day, reassured that you can easily run home to grab anything you might forget. With tidal pools, dolphins, dunes, deep beaches, and pink sunsets, you simply cannot ask for more. *****LAYOUT: ***** 1900 sq. ft. Bedroom 2: Bunk Room 2 twins in Bunk and One Additional Twin. Our vacation was wonderful. The house is a very short walk to the beach and the house was large enough to accommodate all of us. The house was furnished with everything that we needed for our stay. We had a wonderful experience here. The house was great.. location was perfect. I would definitely stay here again. Kitchen was fully equipped and they had tons of beach items chairs buckets etc.